Kitesurfing in Cumbuco ! It´s Paradise in Brazil ! !!! At the moment there is one ATM in Cumbuco at the gas station which accepts American Express, Maestro & Mastercard ! Further ATMs you can find in Icarai 10 minutes bus ride and then Caucaia a 30 minute bus ride away. We recommend to bring cash, credit cards Visa and Master !!! 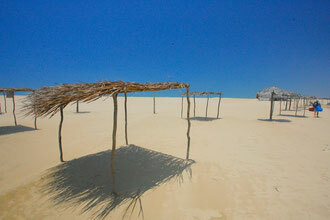 Cumbuco is a small, laid back brazilian beach village only 45 minutes north from the International Airport of Fortaleza. The spectacular sand dunes and the beautiful beach decorated with coconut trees already achieved legendary status. 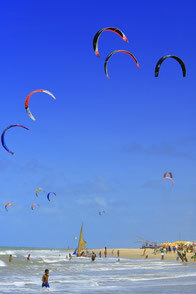 Arround Cumbuco you will find miles and miles of empty perfect beaches for kitesurfing and windsurfing. The sun shines almost all year round with a nice average temperature of 28° C. Even if you are not addicted to kitesurfing there are many other activities you can choose from e.g horseback riding and buggy tours and soon you can even play golf. The windiest time is from June till January with almost 100 % wind guarantee. From February till May the wind is more unreliable with 65 % wind guarantee. 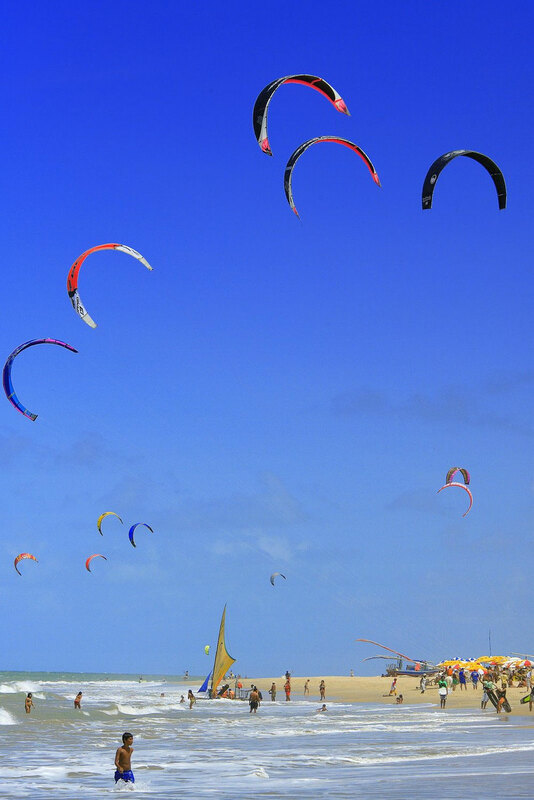 If you bring 3 kites you will get the most kiting days as possible. And this is not all after sunset there are a couple of restaurants and bars where you could start your evening with the famous brazilian caipirinha or enjoy the freshly catched fish or the great brazilian steaks. The fun doesn't stop when the sun goes down, it just begins. 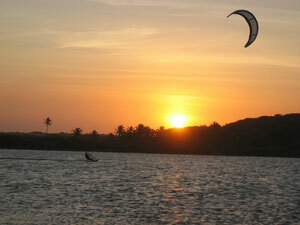 Only 30 minutes away Fortaleza has something for everyone, and this is especially true after dark.